Location, Privacy & Lakefront Views! This is the home everyone is talking about! Phillip’s Palace is the most sought after home in the Rolling Hills & Celebration area! Located less than 5 minutes from Disney and 10 minutes from downtown Celebration, Phillip’s Palace was custom built for my personal use and now you can enjoy this fantastic home! Filled with luxurious furnishings and decor this home is for those who appreciate the finer things in life - yet don’t want to pay Disney thousands of dollars nightly for the privilege of staying on property. From the moment you pull up to this home, located at the dead end of of a Cul De Sac street, you will appreciate the large pavered driveway that easily accommodates 4 vehicles with ease. As you enter the travertine entry and open it’s double doors you will see thru the formal entry and living room into the huge covered lanai and oversized pool. Spectacular view after spectacular view can be enjoyed from the breakfast room, living room, breakfast nook the family room featuring a triple sliding door that disappears into the walls and and of course the pool itself. JUST ADDED! The latest and most modern TV made - a 60 Inch Ultra 4K Television! Enjoy the unbelievable picture of a huge 4K TV in the family room now. You can sit at the breakfast table, one of the three lazy boys in the family room, the plush pool side rocker lounge chairs under the covered lanai or in the oversized pool spa and watch the nightly fireworks of Disney. Early mornings you will enjoy the colorful spectrum of the low flying hot air balloons as they gently float by overhead. All the day you will be entertained by the majesty of the huge assortment of wildlife that partake of the 20 acre water and conservation area. Watch as the Sandhill Cranes bring their babies up to your pool or the majesty of a huge American Eagle soaring above the lakes seeking it’s next pray. Storks, Flamingos, Ducks, Herons, Turkey Buzzards and many, many more water foul will help you relax your day away in this beautiful home. It's so, hard to believe it is so quiet and yet so close to Disney - literally only 3 miles from Disney’s Animal Kingdom park- and you don’t have to fight the huge traffic issue to get to Disney! Yes this home is designed for those who enjoy and understand the advantages of great living. The oversized foot 40 long pool, the large 6 person spa, the “clear view” screen that allows you to see it all, without the little bugs to annoy you. The home is designed for adults, families with older children and business men who want to take advantage of bringing associates and family with them to the area. The home features two master suites each with king beds and private baths. Two other bedrooms with queen size beds and a full bath between them. The family room not only offers spectacular view of the lake, fireworks and pool area but also has a 60 inch Ultra 4K HD televisions programmed with cable TV and over 400 channels. If you are looking for your own “world” while visiting Disney or other theme parks you -have found it. Every theme park is less than 20 minutes from this home. Literally hundreds of restaurants are within 20 minutes . For the golfer’s you have over 50 course within 20 minutes of the home. Courses like Celebration, Mystic Dunes, Championsgate’s 3 courses, Reunion’s 3 courses, Orange Lake, Orange County National’s 3 courses, Disney’s Courses including the Magnolia Course, Falcon Fire and over 50 others! This is the home you have been searching for - but don’t be disappointed - reserve it now, if you don’t somebody else will! If this home is to big or not big enough check out my other Disney homes. Listing #4559 was a custom built 3 bedroom home that was originally built for me. 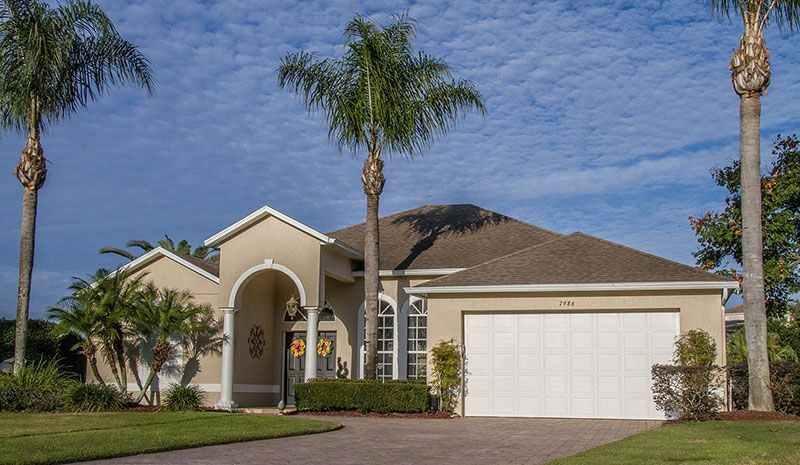 Listing #9390, Listing #7171 is a 6 bedroom home located in the resort community of Windsor Palms. Listing number 9392 was a custom built 4 bedroom condo I had designed for my parents - all of them are as close to Disney as this home. We moved to Florida permanently in 1996 after spending the winter and the first quarter of 1995 here. We sold our home and business in Kentucky because we wanted to enjoy the warm winters. We traveled for three and a half years while living full time in a motorhome until we built this home. Late in 1999 I decided to become a realtor and became a broker in 2001. I enjoy meeting people and helping them enjoy what we have became more than a hobby. We have recently acquired another motorhome and hope to travel a few months a year in it again. We enjoyed this home and shared it with family and friends for many years. This home was designed to be our permanent home and has many, many features for safety and comfort. This home is a Hurricane resistent home. It's walls are permanent as they are steel and concrete - we wanted to feel safe when we were here and think our guest will enjoy this quality as well. We had three hurricane'"eyes" to come over our home in about 4 weeks in 2004. We had NO damage! While other homes around us lost roof shingles and pool screens we had no damage. We didn't even lose our TV signal during any of the storms. We have owned this home and lived in it ourselves until 2015. As a licensed Real estate broker I have assisted many people with the purchase or rental of homes for the past 16 plus years as well. We love sharing our homes with our guests. We listen to the guest and try to provide the things they want and like while trying to keep our rental affordable to everyone. After being in business for many years one thing I realize is we aren't perfect and different guest will expect different things. We provide the homes with what most families have asked for AND used from our experiences. If we don't have what you desire - we will try to get it for you - our goal has always been to satisfy our customers and make their vacations the best possible! Location, Location and location! Great Neighborhood, nice size home. This is one of the few places you can get to Disney's World Drive or Disney's Animal Kingdom Park in less than 5 minutes of real driving time. Located on the preferred side of I-4 the west side close to Disney, yet only minutes from easy I-4 access to easily navigate to the other theme parks, convention center, downtown Orlando and the Orlando International Airport. 12 foot wide stack and pack totaling hiding sliding door from family room to pool area. Huge 40 foot chevron shaped pool with separate large raised spa. Large covered porch inside the lanai with luxurious patio furniture. All of this overlooks lake and conservation area. Spectacular views, privacy and upscale bedrooms with flat screen tvs in each. The family room has a 60 inch 4K Ultra HD TV. Phillip's Palace overlooks a 20 acre nature preserve with several small lakes. This lake has many foul visitors daily and lots of other wildlife! The home has cable TV offerings hundreds of programs and special HD channels. POOL HEAT IS ADDITIONAL $30 PER NIGHT PLUS TAXES. POOL HEAT IS $30 PER NIGHT PLUS TAX. Disney World's Animal Kingdom park is only 3 miles and access to all Disney parks is Nearby. Disney's Wide World of Sports is less than 10 minutes away. Miniature Golf 2 is within 2 miles. The quaint community of Celebration is less than 5 miles from the home as well as exceptional discounted shopping centers being only 15 minutes away. Spring Training is nearby with several major league teams training centers being 15 minutes to 1 hour away. Universal Studios and Sea World are also less than 20 minutes away!